A disturbing PETA Asia eyewitness investigation of the wool industry in the UK shows workers beating, stamping on, kicking, mutilating, and throwing around sheep. Please read the following information from PETA ,watch the video and share widely. Warning video contains graphic content showing animal cruelty which some people will find upsetting. Frankly if you don’t, you don’t have a heart. “Wool is cruelly derived, no matter where it comes from. Abuse on Australian wool farms is well documented. Now, a disturbing PETA Asia eyewitness investigation of the UK wool industry shows workers beating, stamping on, kicking, mutilating, and throwing around sheep there, too. In PETA Asia’s investigation, an eyewitness saw cruelty in every one of the 25 English shearing sheds visited. Workers stood on the necks of panicked sheep and violently punched these gentle animals in the face and beat and jabbed them in the head with clippers. Gaping wounds were sewed up without pain relief. A farmer dragged two sheep who were unable to walk into a shed and left them without veterinary care. They eventually died. Several more died of a condition that a farmer called a “heart attack” during shearing. Warning this video is extremely disturbing. I could not watch it more than a few seconds. If you view on You Tube you will need to sign in the prove your age. Please share PETA Asia’s investigation with your friends and family and let everyone know how sheep suffer for wool. If you wear wool please sign the pledge at the end of the web page above to stop doing so. By wearing wool you are complicit, as of course this perpetuates this awful cruelty to these gentle animals. Sheep are highly intelligent creatures, they are sentient beings and they suffer from abuse and cruelty as you would yourself. On 22 August, Channel 4 News aired undercover footage recorded by animal rights organisation People for the Ethical Treatment of Animals (PETA) Asia. The undercover investigation captured violent assaults on sheep bred for the British wool industry. It’s not very often that sheep are recognised for the intelligent creatures they are. The following article from care two sets out ten fascinating facts about sheep which most people do not know and shows you just how intelligent they are. The exciting news right now is that Norway are Banning Fur Farming! Norway has 300 fur farms, which breed and kill approximately 700,000 minks and 110,000 foxes every year, so this is a significant progress for the rights of animals not to be exploited abused and killed simply for fashion or to produce garments which are no longer necessary in modern times when there are so many synthetic cruelty free alternatives. Please take action and help prevent animal cruelty in the wool industry as sheep are abused and killed for their wool. Please help to save defencess sheep from this shocking brutality by sending a message to Urge Express and Forever 21 to drop wool in favour of animal-friendly materials. Learn More – other action to take further down. Warning the video is extremely disturbing. “A disturbing new PETA video exposé of the Australian wool industry—the world’s top wool exporter—reveals that extreme cruelty to sheep continues unabated. Exposés in dozens of shearing sheds on three continents show workers punch, kick, cut up, stomp on, mutilate, and throw sheep down chutes like garbage bags. This latest exposé shows more of the same—sheep shearers in Australia violently punched these gentle animals in the face and beat and jabbed them in the head with sharp metal shears. 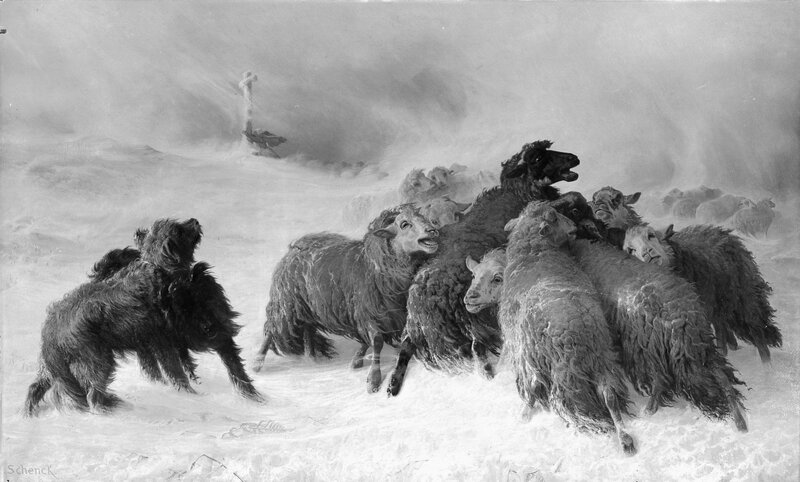 The attacks often left the petrified sheep bleeding from the eyes, nose, and mouth. Please continue reading and send a message to Urge Express and Forever 21 to drop wool in favour of animal-friendly materials. Click the Take Action button to send the message which you can edit using your own words if you can do so, if not please send it as it is. You can also help sheep by refusing to buy wool. Leave wool and other clothing derived from animals such as mohair and fur out of your wardrobe. There are humane modern fabrics such as cotton, rayon, acrylic, hemp and nylon. Modern synthetic fibres are more versatile, warmer, easy to care for and most importantly humane. I have a fondness for timid gentle sheep whom I often see grazing in the countryside close to where I live, out in all weathers often suffering injuries, neglected, open to the elements, predators and all manner of hazards. Sheep suffer like all farm animals for products we do not need, namely meat and wool. Please help sheep by changing to a vegan lifestyle and keep wool out of your wardrobe and meat off your plate. “Sheep are gentle individuals who, like all animals, feel pain, fear, and loneliness. But because there’s a market for their fleece and skins, they’re treated as nothing more than wool-producing machines. Though the next article was written back in 2014 the brutality continues, nothing has changed for sheep exploited by the wool industry. “Most shearers are paid by volume, not by the hour, which means that they have an incentive to work as quickly as they can, with little regard for the sheep’s welfare. Investigators recorded shearers who processed up to 27 sheep per hour and up to 35 lambs. Such fast and often violent work can lead to severe cuts on sheep’s abdomens, hindquarters and limbs – even on sheep’s penises. Large swaths of skin were also cut or ripped off the bodies of many sheep by the shearers. In recent months there has been a spate of sheep racing here in the UK. 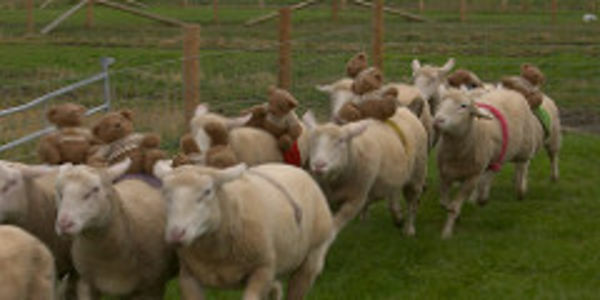 During these races a stuffed toy such as a teddy bear is strapped to the back of sheep and the sheep are made to run in a so called race for entertainment, usually at some kind of village fair. The latest takes place in Masham in the Yorkshire Dales September 30th -October 31st. These races are stressful for timid sheep. Participating in such a race will be terrifying for them. Concerning this particular event the sheep are probably sacred enough as it is being exhibited amongst a crowd of people, this race is an additional fear for them and is unnecessary. Animals are not here for our entertainment. This event is extremely crowded with loud music and so on. It is not really a race, sheep are thrown into a panic and stampede. The Masham Sheep Fair in Yorkshire will be help on Saturday 30th September and Sunday 1st October. Sheep races are due to be held on both days. Sheep are naturally timid and quiet animals. Sheep are not natural runners and making them race is unnatural, exploitative, degrading and frightening. Animals are not ours to use for entertainment. There are many other things going on at this fair – the sheep race is totally unnecessary. Please note the update at the end of the petition and take as many of the actions as you can. “Thank you to all who have signed so far. I have set up a Facebook Online Action for this weekend. I would be really grateful if you could all take part in that also. Please see below for the link to the event with all the details. Maybe many people would think that this is no big deal in a world of turmoil and appalling suffering but for the animals concerned it is a significant trauma and it is animal cruelty. Maybe the organisers simply do not see it this way so please try and persuade them that this is cruel by writing a polite and persuasive e-mail to the organiser Susan Cunliffe-Lister: susan@burtonagnes.com and taking the other suggested actions. There are after all other events and this sheep show is popular in the area and has been so for many years without this race. My family and I went a long time ago before we knew better. I am fond of sheep but this is not a place for people who love sheep or any animal. It is exploitative, even if the organisers do not see it that way. I think there are few people who are deliberately cruel, it’s just that they do not realise the harm that they do. As anyone who has visited my website will know I am very fond of sheep, one of the most gentle of animals on the planet. The shocking cruelty below sickens me, it is one of the many atrocities inflicted upon these defenceless animals, it is brutal and unnecessary and it has to stop. I say unnecessary but frankly there can never ever be any situation where any cruelty to any animal is necessary. “Two years ago, PETA exposed Patagonia’s wool supplier for skinning sheep who were still alive. Once word got out, the brand stopped buying wool from that supplier and made a list of “stringent” standards for its new suppliers. Yet once again PETA has exposed disturbing abuse connected to a Patagonia-approved wool producer. Patagonia says its mission is to “cause no unnecessary harm,” so why is a wool supplier associated with whipping and mutilating pregnant sheep and forcing them to give birth in a freezing desert on its approved list? Please continue reading and send a message to tell Patagonia to drop all wool immediately! 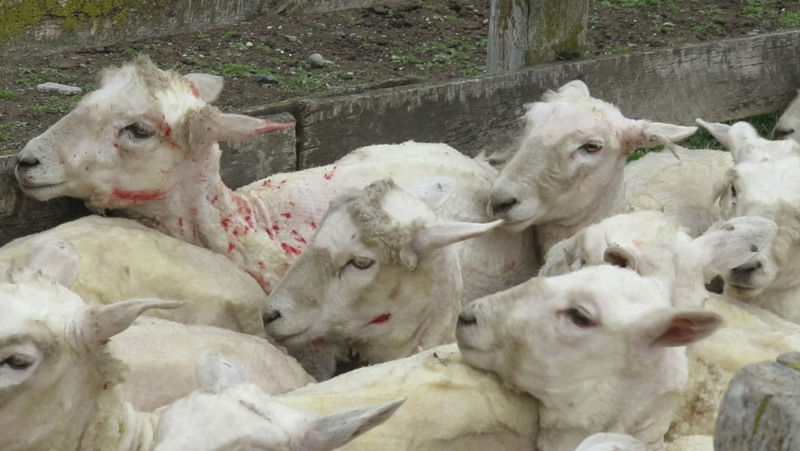 More Proof the Wool Industry Is HEARTLESS – warning distressing images. How people can be so cruel is beyond my comprehension. Just heartbreaking. “The cruelty documented on these Chilean sheep farms is not unique, and similar abuses have been documented in the United States, Argentina, and Australia—the world’s largest wool exporter. Please, don’t forget the gentle sheep who suffer in the wool industry all around the world, and choose clothing that doesn’t contain wool. It’s easy to check the label, and if it says “Italian wool”—or any kind of wool—just leave it on the shelf. Sign our petition urging Chilean officials to prosecute workers who cut into the necks of fully conscious sheep—without doing anything to minimize their pain—in apparent violation of Chile’s animal protection law. https://campaigns.peta2.com/chile-wool-industry/#pledge The link takes you straight to the petition There is more information at the beginning of the petition however the images included are extremely distressing. Even in the most ideal situation sheep suffer from exploitation when they are farmed for their wool. The most effective way to bring an end to this aspect of cruelty to sheep is to stop buying wool. Sheep are sentient beings. Like us they are mammals and like us they feel pain and suffer fear. In the articles below you can read about sentience in sheep and about the exploitation of these gentle animals. Please take action, send the PETA messages to retailer Patagonia and to Chilean officials and share widely and take as many of the other suggested actions as you can. There is a template message, edit with your own words if possible but if for some reason you cannot do this send it as it is. If you do not have a lot of time at least please send the PETA messages. Please stop eating meat and wearing wool the most effective way to bring an end to cruelty to sheep. The following link has more information about the exploitation of sheep and more actions you can take to being an end to their suffering and exploitation. What’s wrong with wearing wool? The following article shows that investigations by animal rights groups such as PETA are effective, however the best way to stop this cruelty is to STOP WEARING WOOL. Be aware that although this prosecution was successful many many similar cases of abuse go uninvestigated and unreported. As already mentioned even in ideal conditions of welfare sheep suffer, they suffer to provide you with a clothing material you now no longer need as synthetic materials are much better, more comfy, warmer and easier to care for. Sheep also suffer to provide you with a food you do not need. At the end of the day most sheep are brutally slaughtered and most of your wool comes from slaughtered sheep. When I first saw the engraving above, I had not up until then seen the painting, I was profoundly moved, the artist has captured the anguish of the grieving ewe at the death of her tiny lamb. Standing in the bleak snowy landscape of winter with large back birds (crows) waiting to devour the flesh of her newborn her sorrow is palpable. I find that in fact the engraving more keenly portrays the bleakness of despair than the painting. I mostly appreciate art for aesthetic reasons but since seeing this work anguish most certainly conveys a meaningful message, particularly in view of the time of year and the recent death from exposure, pneumonia and hyperthermia of an estimated million tiny lambs here in the UK. Schenck 1828 – 1901 was known for his paintings of animals, many of which were thought to be allegorical . 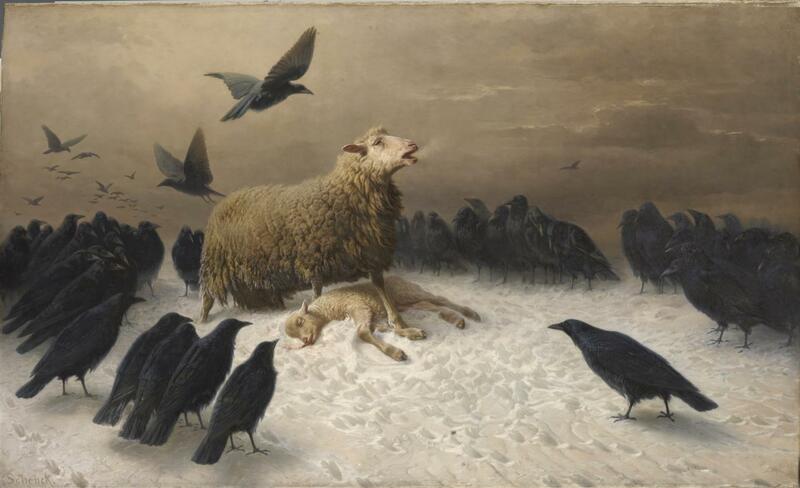 In Anguish, Schenck has given his distraught ewe an expression suggestive of despair mingled with stoic determination. 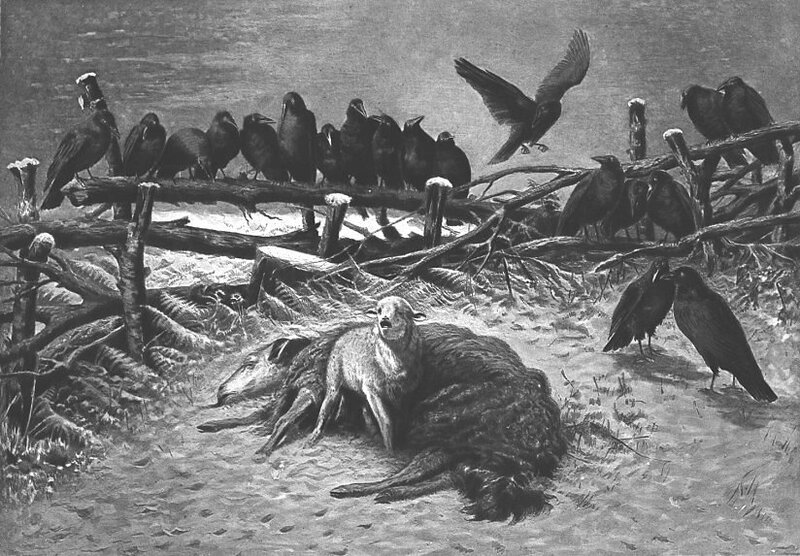 Recognizing these decidedly human responses, the viewer might be expected to identify immediately with the animal’s grim predicament. The ewe’s bravery in the face of the threat posed by the murderous circle of crows is perhaps, however, somewhat overstated in her defiant stance above the bleeding lamb. http://www.ngv.vic.gov.au/explore/collection/work/4344/ – Incidentally I don’t see the “stoic determination” only the despair. While the above perspectives treat this mostly as a metaphor for Human anguish and despair such of course can be manifest in animals, and sheep have emotions similar to our own. Jeffery Massom in this book ‘The pig who Sang to the moon’ tells the story of Rammo, ” a macho two-year old Ramouillet ram” who formed a special and compassionate bond with Whisper, a cow who was born blind. (A) study showed that ewes fall in love with rams, have best friends and feel desolate when those close to them die or are sent for slaughter. The discovery could have important implications for the way farm animals are treated. 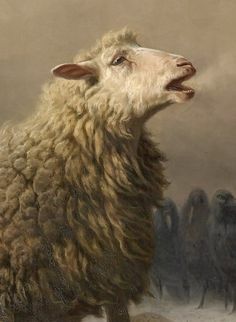 So it can be established that sheep are capable of grief, therefore it is reasonable that the artist was actually portraying the anguish of the sheep and there was in fact no philosophical implication relating to human beings as such, though of course it can be implied. I am not inclined to accept artistic interpretations if they do not originate from the artist his or herself. Maybe the art should be taken at face value which may be to convey the agony/anguish of a ewe for her dead lamb. Below another poignant painting by the same artist entitled The Orphan. Below is a print of this painting. A similar subject but in reverse the Orphan Lamb left to fend for his or herself. While the whys and wherefores, interpretations, history and so on are all very interesting; it is the subject of the art that rings so true. Both paintings depict the despair and anguish of these creatures extremely well. According to this article the painting has also been called Agony and indeed the agony of fear and sorrow is expressed on the sheep’s face and indeed on the face of the orphaned lamb. Amazing art, so powerful, so moving. Tiny fragile lambs born too early as a result of human manipulation to ensure they are ready for Easter. 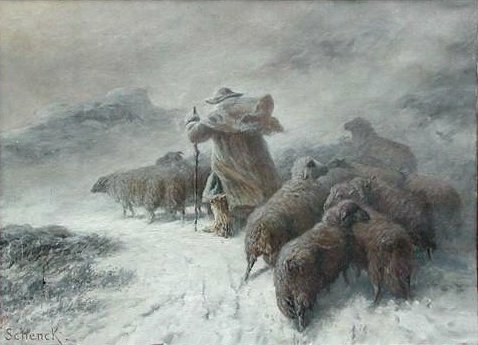 Very much like the paintings, no shepherd comes. Apparently in a very literal way a bird similar to crows; ravens, are harming/killing newborn lambs, yet another hazard to contend with. Hundreds of lambs die as a result of conservation gone wrong, even 10 to 12 ewes have died as a result of attacks by ravens. Time to stop interfering with nature, time to bring an end to farming and the enormous suffering not only to sheep and their vulnerable lambs but all farmed animals of course. There are more actions you can take to help sheep further down. Please take as many as you can. Spring is here – well if you live in the northern hemisphere it is. 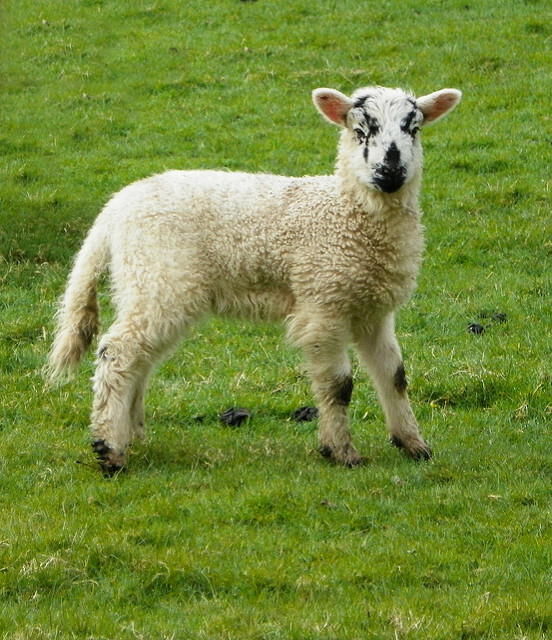 Nothing says spring more than baby animals, particularly lambs, though sadly the fate of these tiny creatures mars the pleasure of seeing these sweet gentle beings frolicking in meadows and uplands here in the British countryside. It breaks your heart to know that soon these innocent helpless creatures will be taken from their mothers and brutally slaughtered to provide meat eaters with a food that they do not need and is not natural. The life of a tiny lamb is short, in general only about four months unless he or she is required for breeding. Some are killed after only 10 weeks, a cruel end to a life which begins with such exuberant joy. Video From Animal Equality:http://www.animalequality.net/node/683 This was filmed in farms and slaughter houses in Italy, but much the same happens worldwide. Though the campaign, which was to reduce lamb consumption in Italy for Easter 2015, is a couple of years old the problem of course remains and with the approach of Easter yet more innocent tiny lambs will meet the same fate. If you eat meat and consume lamb it is likely on average you will have been responsible for the death of 23 lambs in your lifetime. or the adorable lamb in the video further down who is now safe in a sanctuary. How about knit wear made from wool, even lambs wool? Lambs have so little wool so please do not think that someone comes along with a pair of shears and gently cuts their fleece. Lambs wool is of course always taken from slaughtered lambs. Adult sheep inevitably suffer the same fate, even though they may be sheared for a few years prior to slaughter eventually they will be killed for meat. In the meantime other than provide wool, a ewe’s main purpose is to give birth every year until they ‘re too old to do so at which time they too will be mercilessly killed. Ewes are sent to slaughter from four to eight years old when their breeding days are over. What of rams? Ever wondered why you see so few rams? Usually there are about 38 ewes to one ram. Ram lambs not required for mating are killed within a day or two after being born – they will never smell the sweet air of spring or leap and play in the fields. Wool and meat are all the products of the slaughter and other abuse of a gentle defenceless animal who wishes to live as much as you or I. If you buy a garment made of wool you support a cruel and bloody industry. There is no excuse, there are plenty of synthetic fibres many of which are in my opinion warmer than wool, easier to care for and are more durable. However even if this was not so, there is never any justification for such cruelty to another sentient being. Wool belongs to lambs and sheep. It evolved to protect them from severe weather, their fleece effectively providing insulation against both cold and heat. At one time prior to human interference sheep grew just enough wool to protect them from extreme temperatures, they naturally shed their wool in warmer weather. It all seems so idyllic when you see tiny lambs gambolling on a warm summer’s day and you see all the hype on TV and elsewhere about lambing. The truth of the matter is much different. Did you know that rather than being born in the spring as the farming industry would have you believe, millions of lambs are born in January when it is bitterly cold and when a million of these babies die of hypothermia.This is done to provide meat eaters with lamb for Easter. Over the years farmers have interfered with the natural breeding cycle. High prices are paid for Easter lamb and many farmers have changed this cycle so that lambs are born earlier. Read about the truth that lies behind sheep farming that the BBC’s popular Lambing Live programme glosses over . Don’t buy wool, without exception it is a product of cruelty and death. Go Vegan and help others to do so. Each year in Britain over 14 million sheep are slaughtered for the meat trade. Around half of those are lambs under a year old. My husband and I are regular visitors to the Yorkshire Dale and Moors and the Durham Dales. It is a delight in spring to see the mothers with their curious playful lambs. They ‘re so full of joy, skipping and jumping or lying close to one another in the summer sunshine. This is of course in April or later. Earlier in the year it is a sad experience to see these tiny lambs huddled near their mothers who also are struggling to survive against the cold of winter, yes I have seen lambs as early as January and most certainly by mid February and early March when the wind can be bitter with driving rain, sleet and snow. The Yorkshire Moors and Dales are beautiful scenic places and on a visit in spring or summer many people are oblivious to the realities of this harsh climate in which these fragile animals have to endure. The lucky ones who survive, if lucky is indeed the correct word, will in a few short months be rounded up and taken to slaughter. There is definitely a different feel to the place when all these tiny beings so full of life are taken away. One weekend you can be driving through or hiking and see hundreds of lambs and their mothers and the following week the hills are bare of these baby creatures, only the mothers remain to face another autumn when once gain they are impregnated and endure the whole miserable cycle again. Lambs are beautiful creatures, gentle often friendly. We have had lambs and sometimes their mothers come up to us curious about us as we are about them, though the mothers can be very protective of their offspring and you can be met with loud angry bleats. So unless they readily approach you when hill walking it is best to leave them alone as many sheep are timid creatures. “Sheep show compassion! Form bonds! Jeffery Massom in this book The pig who Sang to the Moon tells the story of Rammo, ” a macho two-year old Ramouillet ram” who formed a special and compassionate bond with Whisper, a cow who was born blind. Look at the video of this adorable lamb, surely there can be no doubt that this little animal is a thinking, feeling, aware being. “PETA recently revealed cruelty to sheep at “sustainable” farms in the Ovis 21 network in Argentina and is now exposing another wool farm there. At this farm, workers cut off parts of gentle lambs’ ears, put tight rings around their scrotums, and cut off their tails—all without any pain relief. Shearers hit sheep with electric clippers, slammed them to the floor, and kicked and stood on them. Fast, rough shearing left many sheep cut and bleeding, and they weren’t given any painkillers before workers used a needle and thread to sew up their gaping wounds. After receiving the footage, Chargeurs—a company that supplies wool to retailers around the world—cut ties with the farm, which it had trusted for years. The cruelty documented on this farm is not unique, and similar abuses have also been found at dozens of farms and shearing sheds across Australia and the U.S. There’s simply no such thing as “humane wool,” and that’s why rejecting wool is the best way to help protect lambs and sheep from abuse. Please click the following links to send messages to Chargeurs , Ralph Lauren, J.Crew, and Patagonia. Do read the information if you can. Warning there are upsetting graphics and videos. If you wish to take the actions without seeing the graphics Click the Take Action Button which takes you directly to the message. Please thank Chargeurs for cutting ties with this Argentinian farm, and also urge the company to move away completely from buying and selling wool. It’s time for the company to shift to sourcing vegan wool as more and more consumers look for clothes that are not the product of cruelty. Please ask leading sellers of wool to drop it immediately in favor of animal-friendly materials. For Ralph Lauren, click the following link and use the form at the bottom of the webpage. For J.Crew, send an e-mail to mdrexler@jcrew.com from your personal account. Please thank Patagonia for dropping Ovis 21, but urge them to drop all wool in favor of animal-friendly materials because there is simply no such thing as humane wool. There are template letters to help you, please personalise if you can but if for some reason this is not possible please send anyway. Sheep are amazing creatures more intelligent than you may realise. They are sentient beings and feel pain and suffer as you or I your cat or your dog. There should be no place in any modern ethical society that allows the mistreatment and terrible cruelty that is handed out to sheep the world over day after day after suffering day. Please send as many of the above messages as you can and please stop buying wool and change your diet to vegan to help not only the horrific exploitation of sheep but other helpless defenceless animals who suffer unimaginable cruelty very single day of their short lives. Here is a lovely story that shows sheep to be sentient creatures capable of compassion, caring and forming bonds. “He would graze next to her all day and guide her about the field, making certain she did not bump into the fence or posts…When she had a calf , Shout, sired by an Angus bull, Rammo behaved paternally toward the young animal, more so than even to his own offspring, several bouncy lambs. Whisper lived to be four years and than died in 1996 of a viral infection. Rammo mourned her a long time, standing by her dead body, calling and calling.